Visit this section often to learn about new additions to the PLUS system and new supporters of this international initiative. Keep on top of the most recent developments that affect you and your organization. Read this year's latest activities and developments at the top, with an extended archive of other news from this year, followed by previous years. PLUS and the US Copyright Office. PLUS met with Copyright Office leadership to discuss PLUS Registry integration with copyright registration systems. PLUS at George Mason. PLUS participated in a panel, "Best Practices in Copyright Clearance" at George Mason University Law School. PLUS at the US Patent Office. PLUS participated as a presenter in "Developing the Digital Marketplace for Copyright Works"
PLUS at American University. PLUS organized an interactive session on visual arts copyright issues at the Washington School of Law. USCO Hearing. At the invitation of the US Copyright Office, PLUS provides testimony on visual arts copyright issues at a hearing in San Francisco. DMLA Conference 2016. "Reality Reimagined" at the DMLA Conference 2016 in Jersey City, NJ, Oct 27-29. Meet with and learn from the people who shape the image licensing industry. Always a great event. More. PLUS and NYPL PLUS meets with senior staff at the New York Public Library to explore NYPL use of the PLUS Registry. The NYPL first participated in the PLUS Coalition in 2006, when the Director of the NYPL, David Ferrerio, served as a Founding Director of the PLUS Coalition. PHOTOPLUS EXPO 2016. Register now for PPE in New York City, October 19-22. Largest photo/imaging show in North America, over 220 exhibitors, over 80 conference seminars, keynote presentations, special events. More. CEPIC Congress 2016 PLUS Director Eugene Mopsik participates in the CEPIC Congress in Zagreb, Croatia, representing the PLUS Coalition. Visual Connections New York 2016. Visual Connections New York is the leading professional development event for image/footage/art buyers and researchers. Oct 27 at the Metro Pavilion in NYC. More. PLUS Joins Copyright Alliance.. The PLUS Coalition joins the Copyright Alliance. Representing the interests of thousands of individuals and organizations across the spectrum of copyright disciplines, the Copyright Alliance is dedicated to promoting and preserving the value of copyright and to protecting the rights of creators and innovators. IPTC Photo Metadata Conference. PLUS Director Eugene Mopsik represents PLUS at the 2016 IPTC Photo Metadata Conference. JPEG Privacy and Security Conference. At the invitation of the JPEG Committee, PLUS presents at the JPEG Conference in San Diego, California, and meets with Committee leaders for discussion of PLUS Registry integration for the purposes of enhancing JPEG file format privacy and security. York University and Duke University. PLUS and the California Academy of Sciences. At the invitation of the California Academy of Sciences, PLUS demonstrates the PLUS Registry project to senior staff. PLUS at the US Copyright Office. PLUS CEO Jeff Sedlik and Director Gene Mopsik meet with senior staff at the US Copyright Office and provide a briefing on the progress of the PLUS Registry. New Board Secretary for PLUS-Europe Robin Wilson rejoins PLUS leadership at Board Secretary, PLUS Coalition LTD, a UK-based not-for-profit subsidiary of the PLUS Coalition. Wilson earler served on the PLUS Coalition Board of Directors, representing software developers. Museums and PLUS. PLUS participates in the Legal Issues in Museum Administration Conference in Los Angeles, presenting on the topic of image licensing in the cultural heritage community. ICOMP Brussels PLUS CEO Jeff Sedlik and PLUS Director Eugene Mopsik participate in a Brussels meeting of the Initiative for a Competitive Online Marketplace. PLUS Presents at IFRRO Conference in Mexico City The International Federation of Reproduction Rights Organizations (IFRRO) is a founding member of the PLUS Coalition and holds a Director seat on the PLUS Board of Directors. PLUS makes a presentation on the use of the PLUS Registry by Collective Management Organizations. Visual Connections New York. Visual Connections New York is the leading professional development event for image/footage/art buyers and researchers. More. DMLA Conference. "Unplug, Connect and Engage" with PLUS at the DMLA Conference in Jersey City, New Jersey. Meet with and learn from the people who shape the image licensing industry. Always a great event. More. PHOTOPLUS EXPO. Visit the PLUS booth at PPE in New York City. Largest photo/imaging show in North America, over 220 exhibitors, over 80 conference seminars, keynote presentations, special events. More. PLUS Meets with US Copyright Office. PLUS meets with senior staff at the USCO to provide a briefing on the Registry project. PLUS Advises Judiciary Committee of the US House of Representatives. PLUS meets with legislative staff to disucss copyright modernization issues and the role of the PLUS Registry in connecting creators to their works and rights information. PLUS presents at US Patent Office Copyright Event, "Facilitating the Development of the Environment for Online Licensing of Copyrighted Works" in Washington DC. PLUS Presents at ICOMP Conference in Brussels. PLUS makes a presentation at a meeting of the Initiative for a Competitive Online Marketplace, in Brussels. PLUS and UK Copyright Hub in Joint Workshop. 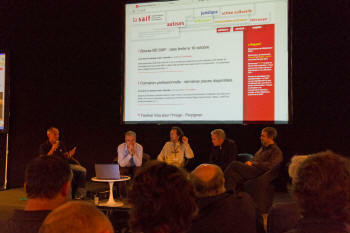 PLUS attends and participates in a Copyright Hub event in the UK. PLUS is a member of the Copyright Hub Partners Board. PLUS Submits Suggestions to the US Copyright Office. In response to a "Notice of Inquiry" announced by the USCO, PLUS submitted comments and suggestions to assist the USCO in improving its operations and in updating US copyright law. PLUS, Pixelrights and UK Copyright Hub conduct Workshop. To demonstrate the integration of the PLUS Registry with other services, PLUS partners with the UK Hub and Pixelrights to conduct an intensive workshop. PLUS in the US Copyright Office Report. The US Register of Copyrights repeatedly references the successes of the PLUS Coalition in her report "Orphan Works and Mass Digitization. "Read the report. PLUS Meets with Czech Photographers. PLUS Representatives meets with photographers and photo agencies in Prague, to coordinate the ongoing expansion of PLUS participation in the Czech Republic. PLUS Presents at the IPTC Photo Metadata Conference in Warsaw. PLUS presents on the use of image recognition and identifiers to connect images to rightsholders and rights information. PLUS Participates in CEPIC. PLUS joined the CEPIC conference in Warsaw, meeting with image distributors to discuss further collaboration in the Coalition. PLUS joins the UK Copyright Hub Partners Board Furthering the collaboration between PLUS and the UK Copyright Hub, the Hub leaders invites PLUS to server on the UK Copyright Hub Partners Board. PLUS attends a Partners Board meeting at the Digital Catapult in London. PLUS and the Hyman Archive. The Hyman Archive, one of the foremost collections of magazines and other publications, joins PLUS after a meeting in London. PLUS and EPUK. PLUS meets with longtime collaborators EPUK in London for an update on PLUS progress. PLUS at PTO PLUS participates on a Copyright Hub panel in "Facilitating the Development of the Online Licensing Environment for Copyrighted Works" at the US Patent Office. PLUS at the Copyright Hub. PLUS and the UK Copyright Hub leadership meet to plan further collaboration. PLUS in London. PLUS presents at "How the Digital and Creative Economies Can Prosper Together," in London. PLUS at Stanford. PLUS participates in the Stanford Law School Copyright Policy Practicum, presenting "Copyright in Visual Artworks: Identification, Metadata, Registration, Licensing." PLUS at Google PLUS session at Google Photo in Mountain View, California. PLUS and IPTC. PLUS continues to participate on the IPTC Photo Metadata Working Group, now collaborating on new metadata fields for use in cultural heritage workflows. PLUS at NPPA PLUS joins the NPPA Board in West Palm Beach, Florida, for an interactive discussion of the importance of the PLUS Registry to photojournalists. NPPA reconfirmed its commitment to dedicate 20% of its Author's Coalition revenues in support of the PLUS Coalition, in addition to a significant and generous grant of funds. ICOMP Meeting. PLUS participates in ICOMP (Initiative for a Competitive Online Marketplace) meeting in London. PLUS is an ICOMP member and advises participants on issues related to image rights and licensing. PLUS General Counsel Testifies. Nancy Wolff testifies before the House Judiciary Subcommittee on Courts, Intellectual Property and the Internet. IPTC Photo Metadata Conference, Berlin. PLUS speaks on the importance of the Rights Data Integration project and on role of global Registries in connecting images to rights holders and rights information. PLUS Meets Catapult and the Hub. PLUS met in London with representatives of the UK Copyright Hub and the UK Digital Catapult, to discuss continued cooperation and integration of the PLUS Registry with the UK Hub. PLUS and UPP PLUS meets in Paris with the leadership of the UPP, to review the progress of the PLUS Registry and to discuss the French translation. PLUS at CEPIC PLUS attends the CEPIC Congress in Berlin, meeting with the CEPIC Board to discuss continued collaboration between PLUS and CEPIC. PLUS and EPUK PLUS meets in London with representatives from the Editorial Photographers of the UK, to discuss the activities of PLUS-UK. ASMP Portland PLUS presents an overview of the PLUS Registry to the Portland Chapter of the ASMP. PLUS in LCC Leadership. PLUS formalizes its role as a Founding Member and Director of the Linked Content Coalition in Europe. PLUS Participates in Collective Licensing Event. PLUS participates as a panelist in US Copyright Office event focusing on collective licensing issues. Abbie Enock Joins PLUS Board. Founder and CEO of Capture Ltd., Enock represents the interests of Application Developers. More about Enock. David Hoffman, "On PLUS." Photographer David Hoffman presented a speech "On PLUS" at the British Library. PLUS is voted into the RDI project. The members of the Rights Data Integration project voted to formally accept PLUS as a member/partner in the project, which aims to link multiple registries across Europe. "What's Up with PLUS and Why You Should Care," an overview of the PLUS Registry is published in the ASPP Picture Professional. Read the article. Copyright Policy, Creativity and Innovation in the Digital Economy. At the invitation of the US Patent Office, PLUS presents the PLUS Registry at a summit held in Washington DC. Association Leaders Meeting. PLUS participates in the annual meeting of association leaders in New York, providing an update on the PLUS Registry. CameraBits Builds PLUS Mechanic CameraBits, maker of PhotoMechanic and other leading applications, continues work on a bulk uploading tool for the PLUS Registry. License Generator Update. PLUS published a significant update to the License Generator on the PLUS site at www.usePLUS.org, enhancing functionality and enabling additional fields. Stipple integrates PLUS Asset ID. PLUS member Stipple has launched Stipple Search and Stipple Mobile, which build upon the vision of intelligent photos. Instead of indexing the websites where an image is used, Stipple Search addresses other key aspects of an image - who, what, when and why. Stipple adds data, context and product information in real-time through image recognition technology - connecting brands and content owners to their images across the web. This enables Stipple Search to reveal relevant information, such as image copyright information and the PLUS Asset ID. With Stipple Mobile now you can easily create photo stories right from your phone. Add videos you�ve shot or from YouTube; Facebook, Twitter, and Wikipedia profiles; and more to the photos you snap � and instantly share them on Facebook and Twitter. Stipple Mobile keeps you connected to your photos once they're shared online. You can even track how many times people see and touch your interactive photos across the web. Visit Stipple at www.stipple.com. Photo Plus Expo. PLUS participates in Photo PLUS Expo in New York City, welcoming hundreds of new members. PACA Conference. PLUS demonstrates PLUS Registry image registration and image search at the Picture Archive of America conference. PLUS Participates in UK Code of Practice Effort. PLUS serves as a member on key committees in the UK addressing issues related to image rights metadata. This month PLUS submitted information to the Copyright Licensing Steering Group (a working group organized by the UK Intellectual Property Office), supporting the development of a "Voluntary Code of Practice on Creating and Maintaining Metadata in Images." Read the PLUS Submission. Global Image Directory. PLUS Member and PLUS UK Working Group participant Michael Brown has reinvented the picturehouse brand with the development of the Global Image Directory, an international resource for stills & motion. With development supported by Mainstream Data, the Directory aims to list all visual content providers and all media. Full integration with the PLUS Registry is planned. Visit www.picturehouse.org to verify your listing. To amend or submit your listing, or to discuss partnerships and investment opportunities, contact picturehouse. Digital Asset Management Conference. PLUS participated in a panel discussion on Digital Rights Management at the Henry Stewart DAM Conference in Los Angeles. PLUS at Photo Expo New York. PLUS participated in the Photo Plus Expo, with hundreds of photographers adding PLUS Registry listings at the PLUS booth, made possible by the generous support of ASMP. Visual Connections New York. Visual Connections returned to the Altman Building on Wednesday October 24th. A Q&A session was held on What you need to know about copyright, licensing and image/footage usage trends,. The exhibit floor had a great line-up of 70 agencies and industry organizations, including 14 new to New York and 15 abroad. Copyright Exchange Feasibility Study," in which the UK Government suggests that the PLUS Registry could be the foundation underlying a Digital Content Exchange system in the UK. PicturEngine integrates PLUS Standards.�PicturEngine provides sophisticated search engine functionality spanning multiple stock agencies and photographers, without duplication. Ad-ID and PLUS. A collaborative effort of the 4As and the ANA, Ad-ID is a web-based system that generates a unique identifying code for each advertising asset, creating a capability to identify them across all media. Ad-ID greatly improves workflow between agency, advertiser, distributor and medium.� the 4As is a PLUS member and holds a Director seat on the PLUS Board.� Ad-ID will integrate the PLUS standards and PLUS Registry API in an upcoming version of the platform, allowing advertising agencies and their clients to more easily and efficiently manage the rights associated with images. VRA and PLUS.� Greg Reser maps PLUS metadata properties to VRA Core and other metadata schemas. CEPIC White Paper Endorses PLUS. CEPIC publishes �Orphan Works and Image Licensing � suggesting the use of the PLUS Registry in the EU. PhotosInfo and PLUS Metadata. PhotosInfo is an app for iPad and iPhone, providing easy access to image metadata. PhotosInfo supports the IPTC Extension and PLUS metadata. Visual Connections Conference. PLUS Board Chairman Roger Feldman participates in a panel discussion, �What you need to know about copyright, licensing and image/footage user trends." CEPIC Congress. PLUS presents "Finding the Rights," demonstrating the value of the PLUS Registry and PLUS standards in connecting images to rights holders and rights information. The international CEPIC Congress is a premier annual event attended by picture library representatives from all countries. PLUS participation is made possible by the generous support of ASMP. Photo Metadata Conference. 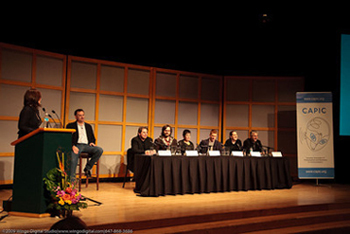 PLUS participates in "The Future of Image Licensing," a panel discussion. PLUS CEO Jeff Sedlik describes past, present and future licensing models and the role of PLUS and the PLUS Registry in ensuring manual and automated access to rights holder information and license information associated with any licensing model. Metadata in the Heritage Sector. PLUS presents to key stakeholders and organizations involved in advancing metadata standardization in the cultural heritage community. PicScout and PLUS. PLUS meets with PLUS Leadership Circle member PicScout to discuss ongoing collaboration on the PLUS Registry. ICOMP and PLUS. PLUS meets with the Initiative for a Competitive Online Marketplace (ICOMP) to discuss PLUS participation in the initiative. ICOMP is an industry initiative and discussion forum for organisations and policy makers involved in the online marketplace, designed to draw up and build widespread support for principles that underpin a transparent and competitive internet. British Library and PLUS. PLUS meets with the British Library to discuss that institution's ongoing use of the PLUS standards in image licensing. Capture LTD and PLUS. PLUS meets with President Abbie Enock and key staff members in Goring on Thames, to discuss pending updates to the PLUS standards. Capture LTD is a leading image licensing platform used by dozens of picture libraries, and fully integrates the PLUS standards. Meeting of Associations. PLUS participates in a roundtable meeting of trade associations representing photographers, picture libraries, illustrators and stock footage libraries. PLUS and CEPIC. PLUS meets with CEPIC's Sylvie Fodor and Sarah Saunders to discuss collaboration on Registry development. PLUS and the UK IPO. PLUS meets with the Intellectual Property Office of the UK to discuss the use of the PLUS Registry in support of a Digital Content Exchange in Europe. Feldman & Associates Host PLUS. Fulfilling a generous support of the efforts of the PLUS Coalition, Feldman and Associates begin hosting the main PLUS web site (usePLUS.org) on servers operated by Feldman and Associates. The PLUS Registry (PLUSregistry.org) remains hosted separately on Amazon Web Services. PPA and PLUS. PLUS meets with David Trust, CEO of the Professional Photographers of America, the largest trade association representing photographers in the USA. PLUS and PPA commit to continued collaboration on the PLUS Registry and Standards. Northern Short Course. PLUS presents at the National Press Photographers of America Northern Short Course in Virginia, discussing copyright, image licensing and the PLUS Registry. PictureHouse Supports PLUS. PictureHouse distributes PLUS Registry invitations to creators and rights holders in more than a dozen countries. PLUS Meets with the US Copyright Office. In one of our periodic meetings with Register of Copyrights Maria Pallante and senior staff at the Copyright Office in Washington DC, PLUS provides an update on the progress of the PLUS Registry. Register Pallante pledges continued cooperation and support of PLUS by the Copyright Office, and suggests that the PLUS Registry could integrate with the copyright registration system in order to provide enhanced functionality. Meeting with Senator Leahy's Office. PLUS meets with Aaron Cooper, Senior Counsel for the Judiciary's Intellectual Property Committee, to update Senator Leahy's Office on the progress of the PLUS Registry, and to discuss developing legislation affecting copyright in the USA. Cooper remains enthusiastic about widespread stakeholder cooperation in the development of the PLUS Registry, which will ultimately mitigate the orphan works challenge and serve as an important step in the process of conducting diligent searches for rightsholders. Canadian Association of Professional Image Creators features the PLUS Registry, urging photographers to register at www.PLUSregistry.org. More. New PLUS Director Representing Museums and Galleries. The PLUS Board of Directors unanimously ratifies the Museum Computer Network's nomination of Dan Dennehy to the PLUS Board of Directors, representing Museums and Galleries, replacing outgoing Director Alan Newman at the end of his term. Mr. Denney is Senior Photographer and Head of Visual Resources, Minneapolis Institute of Arts. The PLUS Board recognizes and thanks Alan Newman for his many years of excellent service to the organization. PLUS in France. PLUS France Working Group member Richard Vagnon participates with trade association UPP in the Salon de la Photo in Paris, France. PLUS and Orphan Works. PLUS participates in a meeting of trade associations to discuss issues related to Orphan Works. PLUS participation is made possible by generous support from ASMP. ARROW+. PLUS discusses collaboration with the ARROW+ initiative, in order to pursue integration of the PLUS Registry in a system spans all EU nations, dedicated to preserving cultural heritage and promoting commerce. Several key leaders in the ARROW initiative have been involved with the development of the PLUS standards. Wonderful Machine features the PLUS Registry on the Wonderful Machine Cog. How To Write (and Read) a License. PLUS President Jeff Sedlik presented a webinar entitled �How to Write and Read a License � in a program produced and sponsored by ASMP and the CCC. Linked Content Coalition. PLUS collaborates with the Linked Content Coalition, a European Commission initiative to create a framework for a fully interoperable and fully connected standards-based communications infrastructure so that businesses and individuals can manage and communicate their rights more effectively online. Embedded Metadata Manifesto. PLUS supports and participates actively in the Embedded Metadata Manifesto, a global initiative to promote metadata awareness and best practices. PLUS Registry Launches Browser Lookup of PLUS IDs Now in Beta testing at www.PLUSregistry.org, the PLUS Registry allows for lookups of PLUS IDs written in URL format, such as http://plus-id.org/[your ID here]. To register and to reserve your PLUS ID and custom PLUS IDs, visit the Registry at www.PLUSregistry.org. PLUS Board Elections. After polling the worldwide PLUS membership, the PLUS Board unanimously approved the slate of PLUS Directors proposed by the Nominating Committee: Clement Mok, Roger Feldman, Judy Feldman, Harold Geller, William Walker, Dustin Wees, Robin Wilson. Director Roger Feldman will serve as Board Chair, replacing outgoing Chair Jeffrey Burke at the end of Mr. Burke's seven year term. Dustin Wees will serve as Vice Chair, with Bonnie Beacher serving as Board Secretary. Copyright Education. PLUS presents at �Know it or Blow It, �an educational workshop hosted by the American Photographic Artists. PLUS participation in the event is made possible by the generous support of the APA. RightsPro.com offers PLUS-based licensing. A leading rights licensing site for the publishing, film, multimedia, education, design, and advertising industries, RightsPro.com has announced full integration of the PLUS standards. More. Photodeck launches PLUS-based licensing. Photodeck provides e-commerce enabled websites to photographers, and now allows photographers to offer PLUSpacks � convenient, standardized bundles of image rights. More. PLUS for Lightroom Updated. The new version of Lightroom provides seamless integration with PLUS metadata fields featured in Lightroom 3. More. PLUS and Getty at Createasphere. Maureen Whalen, the Associate General Counsel for the J. Paul Getty Trust, will be co-presenting a seminar on Rights Metadata with PLUS CEO, Jeff Sedlik. Don't miss Createasphere, the Digital Asset Management conference for the entertainment industry. More. PLUS at ASMP SB3. 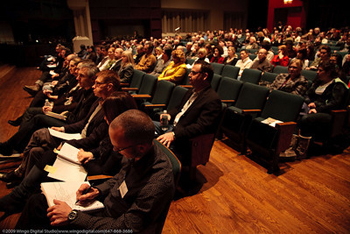 PLUS presented a licensing workshop at ASMP�s Strictly Business 3 Conference (SB3) in Los Angeles. The SB3 conference allows photographers to choose from a selection of topics that will enhance your professionalism and build your business. PLUS will also be presenting at the next two conferences in Philadelphia, and in Chicago on April 1-3. Learn more here. PLUS at DAM LA. PLUS presented �DAM and Rights Management� at the Henry Stewart Digital Asset Management Conference - The Art and Practice of Managing Digital Media. More. Visit PLUS at PDN PhotoPlus Expo. The PDN PhotoPlus Expo is October 28-30, located at the Jacob Javits Center in New York City. PhotoPlus includes a huge expo floor, hundreds of exhibitors, thousands of new products, and over 100 informative seminars. Register Now. DAM LA � Visit Henry Stewart�s Digital Asset Management Conference in Hollywood, California. Use the �PLUS� discount code to receive a $100 discount on conference admission. More. Visual Connections New York. A Participating Supporter of PLUS, Visual Connections (formerly Picturehouse Marketing US), an online directory, provides a variety of other marketing services to help image suppliers connect with image buyers. Visit their next trade fair, �Visual Connections New York.� More about the show. PLUS on Illustration Island. The ever-popular blog, Escape from Illustration Island, features a full-length podcast interview with PLUS CEO, Jeff Sedlik, speaking on image rights management in the digital age. Listen In. PLUS Presents at ICON Illustrator's Conference. At the ICON �Sunny Side Up� Conference in Pasadena, California, PLUS CEO, Jeff Sedlik, spoke to an audience of illustrators on the subjects of copyright, the PLUS Registry, and orphan works. More. IPTC and PLUS Release Photo Metadata Toolkit. The IPTC-PLUS Photo Metadata Toolkit for Adobe CS includes easy to use IPTC-PLUS Metadata panels for Adobe Bridge CS3 and CS4 plus comprehensive user guidelines for these panels and the file-info panels already built into all CS5 products. Learn more, and download the free IPTC-PLUS Toolkit. 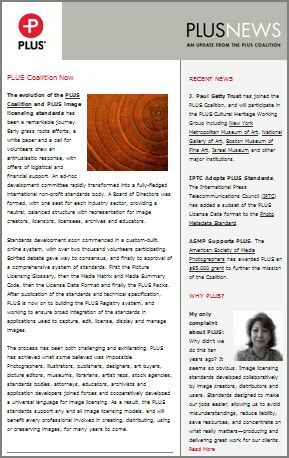 See the latest PLUSnews, our e-newsletter offering updates, commentary and other information about the PLUS Coalition and the PLUS standards. PLUSnews is distributed by email and is also available online. For a free subscription, contact info@useplus.org. PLUS in Adobe Lightroom. Adobe releases new Lightroom version complete with numerous integrated PLUS rights metadata fields, adopted by IPTC. The PLUS metadata fields are found in the "IPTC Extension." More. PLUS Participates in Copyright Education Event. The "Copyright Workshop with Jeff Sedlik", took place in Santa Monica, California, as part of ASMP's "Registration Counts" program. More. PLUS and IPTC Partner on Photo Metadata Tool. At the Photo Metadata Conference, in Dublin, IPTC Executive Director, Michael Steidl demonstrated a new IPTC/PLUS Metadata tool providing read/write access to all PLUS and IPTC photo metadata in Adobe Bridge. The tool will be distributed for free, and is compatible with CS5, as well as CS4 and CS3, allowing users of many Adobe products to use PLUS metadata. More. PLUS at CEPIC Congress. PLUS General Counsel, Nancy Wolff represented PLUS at the New Media Conference, at CEPIC Congress event in Dublin, Ireland. Wolff made a presentation on "Persistence of Photo Metadata" and also participated in the Trade Association Round Table. More. PLUS at the Copyright Society. PLUS General Counsel, Nancy Wolff attended the Copyright Society Annual Meeting in New Jersey, USA. Wolff made a presentation in "Copyright's F-Word: Reconsidering the Role of Formalities in Copyright", a seminar on registries. More. PLUS in Adobe CS5. On April 30, 2010, Adobe released Creative Suite 5, integrating numerous PLUS rights metadata fields adopted by IPTC. The PLUS metadata fields are found in the "File Info" panels under "IPTC Extension." PLUS will also release a free plug-in supporting the use of all PLUS metadata fields in CS5. More. PLUS Presents at Collective Imagination Conference. At the International TMS Users Meeting, PLUS CEO Jeff Sedlik described the application of the PLUS standards in cultural heritage workflows. Through a web-sharing demonstration, Sedlik also informed the Gallery Systems user community of the latest developments at PLUS. PLUS featured at �Copyright, Know it or Blow It.� At an event in Santa Monica, California, the Advertising Photographers of America presented PLUS CEO Jeff Sedlik speaking on the benefits of the PLUS image licensing standards. PLUS Presents at Copyright Conference. PLUS CEO Jeff Sedlik spoke at �Copyright and the New Economy: Issues & Trends Facing Visual Artists,� a conference hosted in New York City by the American Society of Media Photographers. PLUS Participates at ASPP/PACA Conference. PLUS Board member Roger Feldman presented a PLUS overview and update at a four-day conference hosted by ASPP and PACA: �Reinvention Weekend - Reinvent, Reimagine, and Reinvigorate Your Career� in Boston, Massachusetts. Feldman revealed PLUS's new web tools to the image creator and buyers community, with the help of a recorded presentation by PLUS CEO, Jeff Sedlik, featuring a suite of PLUS metadata panels for Adobe Creative Suite 5. The British Library adopts the PLUS Standards in global image licensing platform. The British Library leverages the PLUS Standards in their primary image licensing platform, Images Online. The Library�s PLUS compliant image licenses simplify the process of licensing and managing image rights. More. William D. Walker Joins the PLUS Board of Directors. Mr. Walker has been appointed to the Libraries seat on the PLUS Board, serving on behalf of the Association of Research Libraries (ARL), representing interests of libraries worldwide. He is the Dean and University Librarian at the University of Miami, and serves on the editorial board of the Journal of Library Administration and ARL�s Diversity Committee. Mr. Walker previously served as the Senior Vice President of the New York Public Library and the Andrew W. Mellon Director of the Research Library. PLUS Presents at PMA. PLUS participated in the PMA 2010 conference in Anaheim, CA. Jeff Sedlik provided an overview to Professional School Photographers Association (PSPA) of the challenges faced by school photographers, and spoke about the use of PLUS Standards to benefit school photographers and their customers. PLUS presents at Createasphere. Jeff Sedlik spoke at Createasphere/EXPLORE Entertainment Technology Exposition in Universal City, CA, on �Rights Management & Protection of Assets�. Harold S. Geller Joins PLUS Board. A leading expert in asset management in the advertising industries, Geller is the Senior Vice President for Cross-Industry Workflow at the American Association of Advertising Agencies, and Managing Director for Ad-Id. Says Geller, �The PLUS standards will allow advertising agencies and advertisers to more efficiently acquire and manage image licenses. We look forward to integrating the PLUS standards in Ad-ID, a platform jointly offered by the 4A�s and the Association of National Advertisers, used by advertisers and agencies to manage all of their advertising assets.� More. AAAA Joins PLUS. The American Association of Advertising Agencies (AAAA, or "4A's") has joined the PLUS Coalition, also taking a seat on the PLUS Board of Directors. An influential organization with a 93-year history as a national trade association representing the advertising agency business, the 4A's will represent the interests of advertising agencies and advertisers, worldwide. AAAA joined PLUS at the Leadership Circle level. More. NPPA Supports PLUS. The National Press Photographers Association (NPPA) has made a substantial contribution of funding to the PLUS Coalition. The $25,000 grant arose from funds received by NPPA from the Authors Coalition, resulting from repatriation of foreign non-title specific royalty payments for American works photocopied abroad. More. PLUS for Lightroom PLug-in Released, with Video Tutorials. Photographer and application developer Timothy Armes has released PLUS for Lightroom, a fully-featured PLUS plug-in for Adobe Lightroom allowing users to create and batch-embed industry standard PLUS license statements in image files. Available from Tim's site, Photographers Toolbox. Hindsight Software integrates the PLUS Standards. Desktop business management programs InView and StockView 5.5 include a new PLUS � compliant licensing module for photographers. More. Press Release. Marybeth Peters, Register of Copyrights, meets with Jeff Sedlik, PLUS President and CEO, and Senior Copyright Office staff to discuss continued cooperation between the PLUS Coalition and the Copyright Office. Among the topics covered: automated copyright registration, PLUS Registry integration, improvements to the eCO registration system, reform of federal regulations to simplify registration, the use of PLUS metadata in copyright registration searches and the progress of the PLUS initiative. The PLUS Coalition was formed in part based upon a discussion between Sedlik and Ms. Peters in 2002. The Smithsonian Institution presents a special PLUS event, �Beyond the Copyright Field: Current Trends in Rights & Licensing Metadata.� PLUS President, Jeff Sedlik, spoke before an audience of rights and reproduction staff from over two dozen of the various units across the Smithsonian Institution. Additional attendees included the Smithsonian DAMS department, attorneys from the General Counsel and office of contracting. Alan Newman, of the National Gallery of Art, provided an overview of the integration of the PLUS Standards into the digital asset management system at the National Gallery of Art. PLUS Presents at DAM LA. PLUS participated in the 2009 Henry Stewart Digital Asset Management Conference, in a seminar entitled �Latest Developments in Rights Management.� More. PLUS Presents at the Museum Computer Network Conference 2009, PLUS spoke to the Intellectual Property Special Interest Group of the Museum Computer Network (MCN), at their annual conference in Portland, Oregon. PLUS provided an update and a proposed agenda for the PLUS Cultural Heritage Working Group (PLUS-CH). PLUS-CH will identify and recommend revisions to the PLUS standards necessary to support image licensing workflows in museums, archives, libraries and educational institutions. More. APA Supports PLUS with a $25,000 grant. Advertising Photographers of America has made a major contribution to the PLUS Coalition, supporting further development of the PLUS standards and the PLUS Registry. APA National President, Theresa Raffetto, says, "APA is proud to stand with PLUS in their pursuit to complete this registry to combine universal standards for image licensing with a global registration system for creators and licensors. We hope that our significant grant to the PLUS Coalition will inspire others to increase their support of this critical initiative." More. ASMP Awards $150,000 in Funding to PLUS. This significant grant from the American Society of Media Photographers will support development of the PLUS Registry, a resource providing unique searchable identifiers and image recognition to determine an image creator's name, contact information and usage rights. "The PLUS Registry is an important tool which will greatly benefit ASMP members and all professional photographers," said Richard Kelly, President of ASMP and Principal of Richard Kelly Photography. "We are pleased to be able to use funds from the Author's Coalition for this important initiative." More. PLUS selects PicScout Technology. The PLUS Coalition has named PicScout the exclusive provider of image recognition services to the PLUS Registry. Image users will easily and quickly identify image owners and will access image rights information simply by uploading a copy of an unidentified image to the online PLUS Registry. PicScout's proven image recognition technology will then identify any matching images in the PLUS Registry, and PLUS will provide the image user with the names of the creator, copyright owner and authorized licensors for the image. Image users may also use PLUS-IDs and Digimarc technology to identify rights holders and rights information in the PLUS Registry. More. ACAP Releases Version 1.1 with PLUS Integration. Automated Content Access Protocol (ACAP) has released a new version allowing search engine web crawlers to recognize the presence of embedded PLUS rights metadata in images found on web sites. More. PSPA joins PLUS.Professional School Photographers Association International (PSPA) advances the business of school photography. Through education, research, and events, PSPA honors generations of professional photographers and labs who established the time-honored value of capturing memories, elevating professional standards, and discovering new business strategies. PSPA will be focusing its PLUS Coalition participation on ensuring that school photographers and their customers will benefit from simplified communication of rights information and automated recognition of image licenses by photofinishing services, photofinishing machines and consumer photo printers. PLUS Presents at CEPIC Dresden.PLUS General Counsel Nancy Wolf participated in the 2009 CEPIC Congress in Dresden, making a presentation on image rights issues. PLUS member CEPIC hosted a very successful and informative conference, with over 600 participants from 39 countries worldwide. PLUS Participates in MILE image rights event. The MILE initiative hosted "Know Your Rights," an event in Dresden focused on trying to improve the security of digital images online by showcasing and discussing technological developments such as digital watermarking, image tracking and PLUS. PLUS Admitted to MILE. After review by the European Commission, the PLUS Coalition has been admitted to MILE - the Metadata Image Library Exploitation initiative. MILE seeks to harmonize the use of metadata in images throughout the European community. PLUS has participated in MILE from its inception, and is cooperating with MILE and promoting the adoption and use of PLUS rights metadata standards to satisfy the directives of the European Commission. PLUS Participates in World Copyright Summit.PLUS CEO Jeff Sedlik was an invited speaker at the World Copyright Summit, which brought together creators, rights organizations and guilds, policymakers, content service providers, broadcasters, telecommunications operators, hardware manufacturers and legal experts to debate the future of copyright and the distribution of creative works in the digital era. There were over 600 attendees from 290 companies and 68 countries. An Art Producer's Perspective on the PLUS Standards. Kat Dalager, Director of Print Production for leading ad agency Campbell Mithun, offers this perspective on PLUS: "The PLUS Standards make our jobs easier, allowing us to avoid misunderstandings, reduce liability, save resources, and concentrate on what really matters -- producing and delivering great work for ...... Click here to read more. Northplains Commits to Integrate PLUS in Telescope DAM, an award-winning digital asset management platform that enables the secure access, management and distribution of all digital and rich media content across an entire organization. More on Northplains and Telescope. Hugo & Cat Integrating PLUS Licensing for the Bridgeman Archive. Hugo & Cat, an online and interactive consultancy creating engaging and practical solutions for complex brand and business challenges, has announced that it is integrating PLUS standards into the image licensing platform of the Bridgeman Archive, one of the world's leading picture libraries. IPN Commits to Integrate PLUS Standards.The Independent Photography Network has committed to include PLUS in IPNStock, an image licensing portal organized to provide easy access and a large diversity of choices for art buyers and photo editors worldwide. IPNstock.com incorporates the best features of the Web: easy navigation, viral search capabilities, new images daily, lightboxes, e-commerce licensing, slideshows, built-in pricing and excellent customer service. Digital Fusion Commences PLUS Integration. A leading digital photographic rental & post-production facility, Digital Fusion specializes in state of the art studio and location digital capture, retouching, scanning, printing and archiving. Building on a foundation of post production , DF is adding PLUS to allow its customers to leverage the standards when delivering photographs. Copyright Registry to Integrate PLUS Standards. The Copyright Registry, not affiliated with the US Copyright Office, is an internet-only service that is owned by StockPhotoFinder.com (a PLUS Leadership Circle member), and was created specifically to anticipate and address key elements of impending "Orphan Works" legislation. The Copyright Registry will incorporate the PLUS standards to allow users to easily identify and understand the rights associated with images. Randy Taylor, President of StockPhotoFinder.com, is a PLUS volunteer and conceived of the numbering system for the PLUS Summary Code. PLUS forming Digital Asset Management Working Group. Over the coming months, PLUS is inviting Digital Asset Management consultants and application developers to participate on a working group dedicated to the integration of PLUS in DAM applications. This Working Group will be activated in early 2010, as part of the PLUS "Integration Phase." Lightbox Network to Integrate PLUS Standards.Lightbox Network is a leading tool used to accomplish the many collaborative tasks professional photographers, labs, and photo editors need to perform with digital photographs. From Prep to Shoot to Post to Delivery, LightBox Network is comprised of simple and powerful features that enable the users to easily communicate, collaborate and do the business of photography. Lightbox Network will integrate PLUS standards to allow users from all industries to easily communicate and manage the rights associated with their photography projects. PLUS Canada Launched. Hundreds of professionals attended the launch of the PLUS-Canada Regional Working Group in Toronto, in an event hosted by the Canadian Association of Photographers and Illustrators in Communications (CAPIC). The packed event was held at the Canadian Broadcasting Corporation and was webcast live across Canada to hundreds of additional viewers, including groups of professionals gathered in studios to watch and participate interactively. Representatives of numerous industry sectors were present in the audience, including photographers, illustrators, stock agencies, designers, ad agencies, museums, libraries, software developers and educational institutions. A PLUS overview by Jeff Sedlik was followed by a lively panel discussion moderated by art buyer Heather Morton leading a panel featuring an art buyer, designer, photographer, illustrator and magazine photo editor from leading Canadian companies. Sedlik and the panel then fielded questions from the audience, including those watching via webcast. More. ASMP Funds Critical PLUS Initiatives. The American Society of Media Photographers has awarded a grant of $85,000 to the PLUS Coalition.This generous grant was made possible by a 2007 distribution of funds received by ASMP from the Author's Coalition of America. More. Major Publishers Adopt PLUS Standards. Three major publishers have called for the adoption of the PLUS (Picture Licensing Universal System) standards by picture archives, photographers and all other image suppliers. Representatives of McGraw Hill, Houghton Mifflin Harcourt, and Pearson each announced that they will adopt the PLUS Picture Licensing Glossary definitions in their contracts, and that they encourage image suppliers to begin embedding PLUS license metadata in all images within one year. Press Release & More. PLUS & IPTC Support Adoption of Metadata Working Group Guidelines. Intended to increase operability of digital image metadata across all hardware, software and services, the Guidelines were developed by a consortium of leading companies. More. PLUS Presents at 2008 Henry Stewart DAM Conference. In "Rights, Images and PLUS: Challenges and Solutions," developers of Digital Asset Management systems received an overview of the PLUS Standards, and guidance on implementing PLUS in their applications. PLUS Presents at 2008 Open-XMP Summit. In a meeting of industry-leading organizations PLUS discussed the benefits of implementing XMP to communicate rights information associated with images. ImageSpan Launches LicenseStream Featuring PLUS Standards. PLUS Leadership Circle member, ImageSpan, launches a PLUS compliant web-based application for use by photographers and other image licensors in offering and managing their images. ImageSpan Press Release & ImageSpan. PLUS Presents at 2008 PACA Conference. In "PLUS Takes Root in the Publishing Industry," PLUS CEO, Jeff Sedlik, moderated a panel of leading publishers in a discussion of the challenges faced by publishers in managing the rights associated with the huge number of images that they receive from image suppliers. The publishers were unanimous in their support of the adoption of the PLUS Standards, which will allow for the automation of rights management in digital asset management systems. BlinkBid to Integrate PLUS Standards. The developers of BlinkBid, a leading application used by photographers to create estimates and invoices, commit to incorporate the PLUS Standards. BlinkBid. Adobe Photoshop Lightroom 2 PLUS Plug-in Beta. Developer Timothy Armes begins beta testing of a plug-in that allows users of Adobe Photoshop Lightroom 2 to embed PLUS metadata in image files. Adobe Photoshop Lightroom 2. Adobe Announces CS4. PLUS Leadership Circle member Adobe Systems has announced Adobe Photoshop CS4 and Photoshop CS4 Extended. Look for PLUS "File Info" panels in an update to CS4. More info. 20/20 Sotware Annouces PLUS Integration. The PLUS Standards will appear in 20/20 Software's Prostock Agency image licensing platform, allowing users to select from standardized PLUS licensing menus, and to benefit from embedded PLUS license metadata. More. Pound Hill Offers Metagrove Adobe Plug-ins Featuring PLUS "File Info" Panels. More. ACAP Adopts PLUS Standards. Automated Content Access Protocol has adopted PLUS to allow internet search engines to recognize rights information embedded in digital image files on the web. More. PLUS Presents at Photo Metadata Conference, Malta. David Riecks, PLUS Technical Advisor, provided a PLUS update to the attendees at the 2nd annual Photo Metadata Conference in Malta. Organized by IPTC and IFRA, and hosted by CEPIC, the annual event focuses exclusively on photo metadata, bringing together all interested parties. The conference promotes improved workflow and business processes through proper usage of metadata. PLUS Coalition, LTD, aka "PLUS-Europe," headquartered in the UK, is chartered as as an EU-based non-profit organization. PLUS President Honored by Brooks Institute. On March 1, Jeff Sedlik, Co-founder and CEO of PLUS, was presented with an Honorary Master of Fine Arts degree in Photography at the Brooks Institute of Photography in Santa Barbara for his professional achievements, dedication, and loyalty to the photography profession. He also delivered the commencement address. Visual Resource Association (VRA) joins PLUS as a Trade Association Member. VRA is a multi-disciplinary organization dedicated to furthering research and education in the field of image management working in primarily educational and cultural heritage environments. The VRA holds a seat on the PLUS Board of Directors, representing the education sector. New Board Members Elected. PLUS has significantly expanded its board of directors for 2008. Collectively, the PLUS board members represent the interests of all industries involved in creating, distributing, using and preserving images. More. Adobe Renews Support of PLUS Adobe Systems Inc renews its high level Leadership Circle membership in PLUS, pledging a third year of financial and logistical support of the initiative. PLUS Partipates in the Photo Marketing Association's PMA 08 Conference in Las Vegas. PLUS Participates in ASMP's "Strictly Business 2" program in Los Angeles. PLUS releases Beta 0.2 release of the PLUS License Embedder and Reader Tool, available in the Standards Library in the USEPLUS section of the PLUS web site. PLUS and the US Congress At the invitation of the Library of Congress, the PLUS Coalition participated in Technology and Orphan Works: The State of the Art event on Capitol Hill on December 7 2007. Together with Google and other leading companies, PLUS met with dozens of legislators and legislative staff to discuss the application of standards and technology in solving the orphan works challenge. Digimarc joins PLUS Digimarc joins PLUS as a high-level Leadership Circle member. PLUS will feature Digimarc's industry-leading digital watermark technology in the PLUS Registry system. In Memorium; Jane Kinne, a co-founder and director of the PLUS Coalition, passed away November 3rd from complications of a stroke following heart surgery. She was 82. Jane was widely acknowledged as one of the original architects of the commercial stock photography business, and as a long-time leader in developing professional business practices in the photo industry. She worked actively for nearly sixty years helping to build two stock agencies, leading several industry trade groups, and working as a business and legal consultant. She was a friend and mentor to many. Jane was an ardent supporter of the PLUS Mission. She believed that facilitating image licensing and bringing the picture licensing business into the 21st century with universal and professional standards were important goals worthy of her time and effort. As a co-founder of the organization, Jane helped us to clearly define our mission and guided us with her wealth of industry experience. We will miss her gracious wit and savvy counsel. Jane is survived by her husband of 50 years, Russ Kinne, and their daughter Katherine. Contributions in Jane's name may be made to the NANPA Infinity Foundation, a fund to foster an appreciation of nature through photography. PLUS admitted to WIPO. The Board of the World Intellectual Property Organization has granted the PLUS Coalition "WIPO Observer" status in recognition of the efforts of the PLUS Coaltion to promote international standards for the communication and management of intellectual property rights. PLUS actively participates in WIPO initiatives and activites. PLUS and IDEAlliance co-host the XMP Open Content Metadata Summit in Los Angeles. PLUS Participates in the Henry Stewart DAM Conference in Los Angeles. PLUS Presents at the Museum Computer Network Conference, Chicago. PLUS Presents at the Digital Library Federation Fall Forum, Philadelphia. PLUS Presents at the MILE Intellectual Property Frameworks Seminar in Barcelona. The Metadata Image Library Exploitation (MILE) initiative seeks to harmonize the use of metadata in images throughout the European community. PLUS is cooperating with MILE and is is promoting the adoption and use of PLUS rights metadata standards to satisfy the directives of the European Commission. First Meeting of PLUS-Spain Working Group. The organizations of Spain meet in Barcelona to form the PLUS-Spain Regional Working Group, adding to a growing list of such groups around the world. New PLUS tools! Use the free beta version of the PLUS License Generator to create a PLUS Universal License Summary. Then, embed the Summary into digital image files using the free beta version of the PLUS License Embedder & Reader (see the PLUS Standards Library), which can also be used to read and decode the license information embedded in the image file or contained in an xmp file, allowing anyone, anywhere to easily access and understand the scope of rights associated with the image. PLUS Technical Specifications published. Visit the PLUS Standards Library to access Technical Specifications intended for use by application developers when integrating PLUS standards into applications used for capturing, editing, managing, displaying, licensing and archiving of images. After an intensive two-year international standards review process with participation by more than 2000 creators, distributors, art buyers, designers, attorneys, editors, publishers and cultural heritage institutions, the PLUS Image Licensing Standards were approved on November 1 2006 for worldwide use by all industries. After approval, work immediately began on the PLUS Technical Specifications, released on schedule in October 2007. IFRRO Joins PLUS. The International Federation of Reprographic Rights Organizations joins PLUS, and will participate on the new PLUS Copyright Management Organization Committee. CCC Joins PLUS. The Copyright Clearance Center, a Reprographic Rights Organization based in the U.S., joins PLUS, and will participate in the new PLUS Copyright Management Organization Committee. PLUS Standards and Tools Showcased at PhotoPlus Expo in New York City. PLUS booth generously sponsored by PLUS Leadership Circle member ADBASE. PLUS Presents Rights & Photography, Challenges & Solutions, a panel discussion featuring representatives of publishers, creators and stock agencies. Sponsored by ADBASE, with additional sponsorship by Adobe and Epson. PLUS Presents at APA Copyright Seminar. PLUS CEO Jeff Sedlik provided an overview of copyright issues faced by creators, and of the use of the PLUS system to communicate and manage copyright information. PLUS prepares to release technical specifications and beta applications. PLUS-Japan Summit in Tokyo. Key stakeholders and trade associations from the image licensing industries of Japan converged on Tokyo on September 11 for an event dedicated to the launch of the latest PLUS Regional Working Group, PLUS-Japan. The summit, organized by Japan Photographers Union (a founding member of the PLUS Coalition), was well attended by leading organizations. PLUS presentations were made simultaneously in both English and Japanese, accompanied by PLUS printed materials in Japanese. Participants were provided with a detailed description of the PLUS initiative, followed by an extended interactive Q&A session. 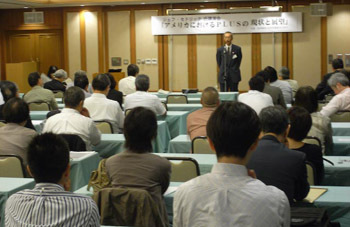 The PLUS-Japan Working Group was launched, and is now recruiting additional participants. A Japanese translation of the PLUS Glossary and other standards is well under way. 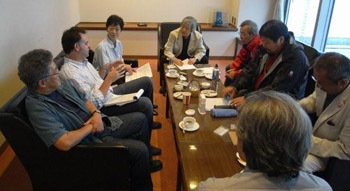 The Summit was preceded and followed by intensive meetings between PLUS and industry representatives in Tokyo. NAPP Joins PLUS. The National Association of Photoshop Professionals (NAPP) joins the PLUS Coalition, participating in PLUS standards building and education on behalf of its 50,000 members in 107 countries around the world. Founded in 1998, the NAPP is a leading worldwide central resource for Adobe Photoshop training, education and news. Alan Newman, National Gallery of Art joins the PLUS Board of Directors. A neutral, apolitical, multi-industry body, the PLUS Board of Directors is the primary governing body of the Coalition, and includes one seat for each industry sector involved in creating, distributing, using or preserving images. PLUS Board seats are held by delegates of leading associations. Mr. Newman has been appointed to the Museum Seat on the PLUS Board, serving on behalf of the Museum Computer Network (MCN), representing the interests of museums worldwide. Mr. Newman is the Chief of the Division of Imaging and Visual Services at the National Gallery of Art, and previously served as the Executive Director of the Imaging Department at the Art Institute of Chicago. More. Press Release. PLUS Board of Directors convenes for annual Board Retreat. The Directors met in Santa Barbara, California for two days of intensive discussion and strategic planning. Microsoft invites PLUS to address the industry at the Microsoft Pro Photo Summit 2007. PLUS President Jeff Sedlik addressed a packed audience of industry leaders at this major industry event on the Microsoft campus near Seattle. Sedlik spoke on the challenges facing creators, distributors, users and cultural heritage institutions in obtaining and verifying permission to use images, and identifying and contacting the rights holders. All of these communities are working collaboratively as the PLUS Coalition to implement standards and registries that will provide the solution. IPTC Photo Metadata White Paper 2007 promotes the use of the PLUS standards for communicating image rights metadata. PLUS representatives Jeff Sedlik and David Riecks represent the PLUS Coalition on the IPTC Photo Metadata Working Group, and co-authored the IPTC white paper with other IPTC members. IPTC is a Leadership Circle Sustaining Member of the PLUS Coalition and PLUS is a member of the IPTC as well. PLUS and IPTC collaborate on metadata standardization, with PLUS addressing image rights metadata, and IPTC addressing other pertinent image metadata. PLUS Presents at the International Photo Metadata Conference. Over 130 delegates from leading organizations worldwide attended this unprecedented event in Florence. Presenters included PLUS, Microsoft, Apple, Adobe, Canon, Reuters, IPTC, BVPA, BAPLA, IFRA, IPTC, Fotoware, Hasselblad, and others. The audience included representatives of manufacturers, photography associations, stock agencies, software companies, attorneys and others. PLUS was presented as the universal solution allowing all image creators, distributors, users and archives to communicate rights metadata. The conference, hosted by PLUS member CEPIC and organized by PLUS member IPTC in conjunction with IRFA, was sponsored by PLUS member Adobe Systems. PLUS Presents at the CEPIC Conference in Florence. A record number of more than 900 delegates from almost 500 companies and some 50 countries and five continents attended this Worldwide Picture Summit covering all aspects of the image licensing business. The Congress was hosted and organized by PLUS member CEPIC (Coordination of European Picture Agencies Press Stock Heritage). CEPIC's membership includes over 1000 stock photo libraries, major photo news agencies, art galleries and museums. The PLUS Coalition includes broad participation across the EU, and CEPIC is leading the way. Stock Artists Alliance releases SAA PLUS Packs Calculator. The SAA is an international association of professional photographers and others who create visual works for stock licensing. SAA leadership and members have contributed significantly to the development of the PLUS standards, alongside other organizations from all industries. SAA Executive Director Betsy Reid served as Chair of the PLUS Packs Working Group and played a central role in standards development process. SAA has yet again stepped up to the plate with the release of the SAA PLUS Packs Calculator, a free tool for use by anyone engaged in image licensing. The Calculator, programmed by SAA member Rivaldo Does, allows for each licensor to independently determining pricing, and allows image licensees to quickly and easily select PLUS Packs in a simple, intuitive web interface. SAA and PLUS encourage the adoption and use of the SAA PLUS Packs Calculator. Free download and more information here. PLUS in the Publishing Industry PLUS presents at the Association of American Publishers' Rights and Permissions Advisory Committee Annual Conference. PLUS presents at PACA Conference in Washington, DC. PLUS presents to PRISM, a working group of PLUS Sustaining Member organization IDEAlliance. The Society of Illustrators (SI) joins PLUS as a Trade Association member. Coordination of European Picture Agencies Press Stock Heritage (CEPIC) joins PLUS as a Trade Association member. The Association of Medical Illustrators (AMI) joins PLUS as a Trade Association member. PLUS Guru Advisory Group is formed. ADBASE President and Co-Founder, Nelson Nunes, to bring his 15 years experience in technological innovations to PLUS as new CTO. PLUS establishes offices in California. The Canadian Association of Photographers and Illustrators in Communication (CAPIC) joins PLUS as a Trade Association member. IDEAlliance joins PLUS as a Benefactor Sustaining Member. PLUS launches newly re-designed website. Editorial Photographers (EP) joins PLUS as a Trade Association member. PLUS printed glossaries available for online purchase. Advertising and Illustrative Photographers Association (AIPA) joins PLUS as a Trade Association member. PLUS achieves approval of Global Image Licensing Standards at the PhotoPlus Expo in New York City. Supplementing last year's release of the PLUS Glossary, PLUS achieved approval of four additional licensing standards: The PLUS Media Matrix, PLUS Packs, PLUS License Data Format, and PLUS-ID System. Read entire press release here. PLUS presents at PACA Conference in Key West, Florida. White House News Photographers Association (WHNPA) joins PLUS as a Trade Association member. Pyramide Europe joins PLUS as a Trade Association member. Pyramide Europe represents over 80,000 photographers, designers and illustrators throughout Europe. ADBASE joins PLUS as a Benefactor Sustaining Member. ADBASE is a leading source of mailing lists for photographers, illustrators, representatives, stock agencies and TV broadcast companies. WongDoody joins PLUS as a Benefactor Sustaining Member. WongDoody finds creative solutions to marketing problems that embrace any and all distribution channels. Masterfile joins PLUS as an Advocate Sustaining Member. Masterfile is a stock photo agency with a large collection of Rights-Managed and Royalty-Free photos and illustrations by world-class artists covering a wide range of subjects. The British Association of Picture Libraries and Agencies (BAPLA) joins PLUS as a Trade Association member. BAPLA is the UK trade association for picture libraries and the largest organization of its kind in the world. With over 400 member companies, it represents the vast majority of commercial picture libraries and agencies in the UK. ImageSpan joins PLUS as a Benefactor Sustaining Member. Imagespan is a content usage and settlement platform deployed either as a managed web service or as a web based application for advertising, print and mobility ecosystems. Imagespan is a complete workflow for the integration of various formats of licensable content, media acquisition, rights management, automated advertising and media distribution. Belay Development increases its support of PLUS to Benefactor Sustaining Membership. Belay Development provides Information Technology, E-commerce, Web site, Graphic Design and Application Development services to its clients. StockPhotoFinder joins PLUS as a Benefactor Sustaining Member. Supported by leading edge technology, StockPhotoFinder.com is a photo search engine that saves users hours each day by enabling them to easily refine searches, edit selections and directly contact all kinds of independent image providers in the fewest steps possible. Photo District News (PDN) joins PLUS as a Benefactor Sustaining Member. PDN is an award-winning monthly magazine that has been covering the professional photographic industry for over two decades. Editorial Photographers United Kingdom & Ireland (EPUK) joins PLUS as a Trade Association member. EPUK is a private email group and public resource for editorial photographers who want to talk about the nuts and bolts of being in business. Professional Photographers of America (PPA) joins PLUS as a Trade Association member. PPA is the world's largest not-for-profit association for professional photographers, with more than 14,000 members in 64 countries. PPA seeks to increase its members' business savvy as well as broaden their creative scope. Association of Photographers (AOP) joins PLUS as a Trade Association member. The AOP brings professional photographers together, protecting their rights and promoting photography. Picture Research Association (PRA) joins PLUS as a Trade Association member. The PRA is a professional organization for picture researchers, picture editors, and anyone specifically involved in the research, management and supply of visual material to the media industry. Wedding & Portrait Photographers International (WPPI) joins PLUS as a Trade Association member. WPPI has grown to be the largest trade show and convention in professional photography. As an association, WPPI works hard to meet the needs of wedding, portrait, commercial, photojournalism and fine art photographers. National Union of Journalists (NUJ) joins PLUS as a Trade Association member. NUJ is the union for journalists in Britain and Ireland. The union was founded in 1907 and has fought for journalists, their pay and conditions, their working rights and their professional freedom ever since. Union des Photographes Createurs (UPC) joins PLUS as a Trade Association member. UPC, the French trade association for professional photographers, protects and defends the interests of photographers as creators. Graphic Artists Guild (GAG) joins PLUS as a Trade Association member. The Guild is a national union of illustrators, designers, web creators, production artists, surface designers and other creatives who have come together to pursue common goals, share their experience, raise industry standards, and improve the ability of visual creators to achieve satisfying and rewarding careers. The Association of Illustrators (AOI) joins PLUS as a Trade Association member. The AOI was established to advance and protect illustrator's rights and encourage professional standards. The AOI is dedicated to its members' professional interests and the promotion of illustration. PLUS attends the Microsoft Pro Photography Summit at Microsoft Headquarters near Seattle, Washington. PLUS meets with leaders of trade organizations participating in the Coalition. PLUS presentation to the International DOI Foundation meeting at Oxford University. The Digital Object Identifier (DOI) is a system for identifying content objects in the digital environment; DOIs are unique identifiers assigned to any entity for use on digital networks. PLUS and DOI are exploring a collaborative effort. PLUS meets with leading publishers and rights clearance agencies to continue their cooperative work. PLUS meeting with representatives of photography organizations in London, several of which have participated significantly in the Coalition. Attendees include representatives from the National Union of Journalists (NUJ), EPUK, SAA-UK, Pyramide, Association of Illustrators (AOI) and Association of Photographers (AOP). The meeting is held to update these participants on the progress of the initiative, and to move ahead, on schedule, with formation of the PLUS-UK working group, which is charged with addressing issues of specific interest to UK licensors and licensees. PLUS-UK will serve as the model for other regional working groups to be formed by participants worldwide. PLUS meeting in Paris at UPC Headquarters, held to update the French associations on the progress of PLUS. Attending were Christian Chamourat, President of AGESSA; Eric Delamarre, President of the UPC; Cecile WANG, Attorney, UPC; Olivier Brillanceau, General Director of SAIF; Peter Lippman, UPC member; and Herve Haddad, owner of Zen Studio, who served as the meeting facilitator and translator. PLUS presentation at the CEPIC World Congress in Biarritz, France. CEPIC is a European Economic Interest Group (EEIG) representing the interests of over 1,000 picture associations, picture agencies, and image libraries in Europe. The 2006 CEPIC World Congress attracted 737 delegates from 412 companies and 50 countries. PLUS President & CEO Jeff Sedlik engages the audience in a discussion of the international community's role in developing and implementing the PLUS standards. At the Congress, Sedlik also meets with many participating picture agencies from around the world to provide updates on the progress of PLUS. Jeff Sedlik, PLUS President and CEO, is named PhotoMedia Magazine's Person of the Year for his work with PLUS. Each year, PhotoMedia recognizes a person in the photography industry who has best demonstrated exceptional artistic and business accomplishments, photographic passion, devotion to the industry, inspiration to colleagues and humanitarian achievements in the community. For his dedication to the above ideals, his commitment to teaching business skills to young photographers and his efforts to standardize image licensing practices, PhotoMedia honored Jeff with this award. "Jeff Sedlik: Navigating the Licensing Waters"
NewsCom joins PLUS as a Catalyst Sustaining Member. NewsCom is a world leader in providing publishers with high-quality content from a wide variety of global sources. National Press Photographers Association (NPPA) joins PLUS as a Trade Association member. The NPPA is dedicated to the advancement of photojournalism in all media. Newspaper Association of America (NAA) joins PLUS as a Trade Association member. NAA focuses on six key strategies that collectively affect the newspaper industry: marketing, public policy, diversity, industry development, newspaper operations and readership. United States Digital Imaging Group (USDIG) joins PLUS as a Trade Association member. USDIG is open to all professionals involved in digital imaging, to help develop knowledge of "best practices" in digital imaging and to provide a forum for discussion with colleagues. Preparation of the drafts for the PLUS Media Matrix and License Data Format continues. Drafts will be presented to the PLUS Advisory Council for review and comment. Digital Railroad joins PLUS as a Benefactor Sustaining Member. Digital Railroad is a trusted provider of online technology and services to the buyers and sellers of professional photography worldwide. Japan Photographers Union (JPU) joins PLUS as a Trade Association member. Studio Photography Magazine publishes an article about PLUS. "The PLUS Coalition: Will This Organization Change the Future of Our Industry?" PLUS presentation at the PACA Conference in Chicago. Jeffrey Burke, PLUS Chairman of the Board and former PACA president, announces his retirement as Jupitermedia's Senior Vice President of Product Strategy. He also discusses the PLUS system with the attending community of stock picture agencies, emphasizing the importance of the PLUS initiative to the future of image licensing. "State of the Stock Picture Licensing Industry 2006" Jeff Sedlik updates the assembled picture agencies on the progress of PLUS in a presentation; many agencies express their continued support of the initiative. Stock Asylum publishes an article about PLUS. "Industry Standards...If all goes as planned, the Plus Coalition should have all three pieces of new image licensing standards in place by mid-October..."
Illustrators' Partnership of America (IPA) joins PLUS as a Trade Association member. IPA is a non-profit organization, whose goal is to create a collective management agency to administer the rights of professional illustrators working in the United States. Australian Commercial and Media Photographers Association (ACMP) joins PLUS as a Trade Association member. ACMP acts as a united voice for Australian professional working photographers. Stock Artists Alliance (SAA) joins PLUS as a Trade Association member. SAA is an international organization of photographers who produce images for rights-protected license. The mission of the SAA is to protect and promote the business interests of its members with regard to the worldwide distribution of their intellectual property. PLUS presentation at the IPTC Conference in Vancouver. The IPTC, based in Windsor, UK, is a consortium of the world's major news agencies and news industry vendors. It develops and maintains technical standards for improved news exchange that are used by virtually every major news organization in the world. PLUS and the conference attendees, representing the major publishers from around the world, explored the possibility of a collaboration between IPTC and PLUS. Communication Arts publishes an article about PLUS. "PLUS: A New Relationship"
Corbis joins PLUS as a Catalyst Sustaining Member. Corbis has participated in PLUS from the outset, and reconfirms its commitment by officially joining PLUS and committing financial support to the initiative. Corbis provides advertisers, editors, publishers, filmmakers, and marketers with a single source for all of their visual needs -- not just images and footage, but the services that make them easy to source, locate, and license. In response to numerous requests, work begins on a printed PLUS Glossary, slated for distribution in October 2006. PLUS presentation and update at ASPP's 4th Education Conference in San Francisco. PLUS President & CEO Jeff Sedlik introduces the PLUS System at the APA San Francisco event, part of his presentation called "Strategic Licensing with Jeff Sedlik: The Art & Science of Maximizing Your Profits." American Society of Picture Professionals (ASPP) joins PLUS as a Trade Association member. ASPP is a nationwide organization of professionals who produce, sell, edit, catalog and use photographic imagery - a forum for education, information, dialogue, interaction and professional growth. North American Nature Photography Association (NANPA) joins PLUS as a Trade Association member. NANPA promotes the art and science of nature photography as a medium for nature appreciation and environmental protection. PLUS presentation to the Washington, D.C. Chapter of the American Society of Media Photographers (ASMP) about copyright and the PLUS system. Jeff Sedlik, PLUS President and CEO, meets with Marybeth Peters, Register of Copyrights, and Tanya Sandros, Associate General Counsel to the Copyright Office. Ms. Peters expresses her support of the PLUS Coalition towards creating image licensing standards. The PLUS Coalition was formed in part based upon a discussion between Sedlik and Ms. Peters in 2002. Getty Images joins PLUS as a Catalyst Sustaining Member. Getty Images has participated in PLUS from the inception of the initiative, and reconfirms its commitment by joining PLUS and providing financial support. Getty Images creates and distributes some of the world's best and broadest imagery collections, making them available in the most accessible and usable way -- 24 hours a day, every day. Jupiter Images renews its PLUS membership as a Champion Sustaining Member. The support and participation of Jupiter Images has been invaluable to the progress of the PLUS initiative. Jupiter Images provides creative professionals with high-quality images that inspire ideas, illustrate concepts and enhance the design of any project at any budget. The British Journal of Photography runs a commentary by editor Simon Bainbridge, "Royalty-free has a cost," and a feature article about the initiative, "Standard to Challenge RF." PLUS begins work on the Media Matrix and License Format standards, integrating examples collected from licensees and licensors worldwide. At the PhotoPlus Expo in New York, PLUS convenes with its member organizations and various photography-related companies, including equipment manufacturers and distributors. In conjunction with the 13th Henry Stewart Digital Asset Management (DAM) Symposium in Los Angeles, PLUS meets with various leading DAM companies to discuss their implementation of the PLUS standards. 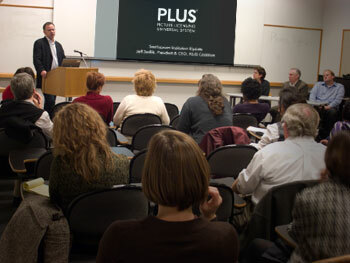 Photo District News (PDN) publishes an article introducing PLUS to its readers. "PLUS Launches with a Glossary of Licensing Terms and Big Ambitions"
The IRS gives its final approval of PLUS as a non-profit 501(c)6 corporation. PLUS formed as a non-profit New York Corporation in October 2004. PLUS Glossary version 1.0 unveiled at PACA Conference in Redondo Beach, California in presentation by PLUS President & CEO Jeff Sedlik. PLUS Glossary Working Group completes final review of PLUS Glossary Draft 3 on schedule. Publication of Glossary version 1.0 on track for October 16. Shutterbug Magazine publishes an article about PLUS and its efforts. "P.L.U.S. Coalition Creates a Universal Language for Image Licensing"
PLUS soft-launches new web site, designed by Pentagram and Belay Development. Additional content added daily through official site launch on October 13, 2005. PLUS Glossary Editors pass PLUS Glossary Draft 3 to the PLUS Glossary Working Group for final round of industry review. Working Group will evaluate and refine the PLUS Glossary for launch on this web site in Q4 2005. PLUS editors process nearly 1000 comments and suggestions received from the Advisory Council during the PLUS Glossary Draft 2 Review Period. During this month-long review, the Advisory Council makes suggestions and proposes additional terms. Advertising Photographers of America (APA) joins PLUS as a Trade Association member. The goal of APA is to establish, endorse and promote professional practices, standards and ethics in the photographic and advertising community. American Society of Media Photographers (ASMP) joins PLUS as a Trade Association member. ASMP promotes photographers' rights, educates photographers in better business practices, produces business publications for photographers and helps buyers find leading professional photographers. PLUS presentation at the inaugural Adobe Ideas Conference in New York, which offers leaders from the design and publishing worlds a unique forum for sharing the latest trends from the industries' creative visionaries and showcasing new and emerging technologies. AIGA, the professional association for design, joins PLUS as a Trade Association member. AIGA is committed to furthering excellence in design as a broadly-defined discipline, strategic tool for business and cultural force. Picture Archive Council of America (PACA) joins PLUS as a Trade Association member. PACA's mission is to foster and protect the interests of the picture archive community through advocacy, education and communication. Note: This Latest News section includes selected PLUS news and is not a comprehensive record of PLUS activities and accomplishments.